While emerging-market (EM) stock performance has been volatile in 2018, long-term demographic and economic changes across EM continue to create fertile opportunities for well-managed businesses capable of sustained growth. An increasing number of EM companies have learned how to compete with their developed-market peers, in many cases adopting new technologies and processes at lower cost than more established rivals. 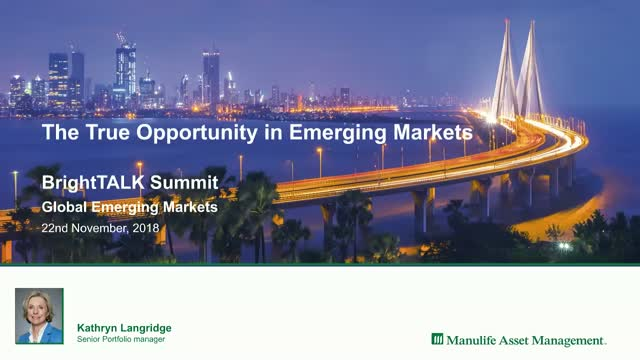 Join Kathryn Langridge, Senior Portfolio Manager, who will discuss the True Opportunity in Emerging Markets. Much has been written about how the U.S.-China trade war has hurt investor sentiment and the macroeconomic environment. But how has the dispute impacted farmland investors and how has it affected global agricultural trade flow? Keith A. Balter, Director, Economic Research, Hancock Natural Resource Group takes a closer look. At this stage in the credit cycle, how should fixed-income investors approach the asset class and how will the strength of the U.S. dollar affect returns? Daniel S. Janis III, who leads our Multi-Sector Fixed Income team, shares his views. He also takes a closer look at emerging markets (EM) and explains why he believes select opportunities could be found within the EM universe. Emily Chew, Global Head of ESG Research and Integration at Manulife Asset Management shares her views on how the role of ESG analysis has evolved and explains why active fund managers integrating ESG research into their investment process could gain an edge over the competition. Will global growth fizzle out in 2019? Not quite. That’s the view of our Global Chief Economist Megan Greene, who expects global growth to slow in a synchronized manner in the year ahead. She also highlights what she sees as key risks in the year ahead and also shares her views on whether the U.S. Federal Reserve’s rate normalization plan could end up hurting economic growth. The final quarter of 2018 will bring about a daisy chain of events that could potentially reshape the global financial and political landscape. Key among them, November’s U.S. midterm elections, the outcome of which could affect—both directly and indirectly— the tone of ongoing trade negotiations between Beijing and Washington and in turn influence the performance of emerging markets in the months ahead. Our Global Chief Economist Megan Greene shares her views on these issues, and highlights others that investors should be aware of. Sandy Sanders, Senior Lead Portfolio Manager for the US Core Value Equity Team at Manulife Asset Management, addresses some topical themes on US equities. This short round up explores the reaction of the equity market to the threat of further tariffs, where quality and value can be found within the markets given the current economic climate, and what lies ahead in the small-cap space. Robert discusses if there are risks around corporate debt that investors should pay attention to. Markets have yet to significantly react to the prospect of a global trade war. Robert addresses if that optimism is justified. Robert discusses if there is a possibility we could see further strengthening to the US Dollar by the end of the year. - What are the key drivers of growth and new investment opportunities across the sector? - What impact will US rates have on asset class performance, and what are the main risks of China’s 2018 policy on emerging markets and potentially, the rest of the world? Given these macro factors, Kathryn briefly explains how the highly experienced Manulife team identify value driven companies through their detailed research and strong governance processes, and how risk is embedded in the team’s philosophy and integrated across all stages of the investment process.